Punktów : 42 Please note that, for now, you cannot download content from our platform directly onto a mobile device (phone, iPod, iPad, tablets...). You need to download your items onto a PC or Mac, and then transfer them onto your device in the normal way. We are working on allowing direct downloads to mobile devices but this is not possible in the current version of the platform. Sorry about the inconvenience! Runtime: 43 minutesDo you know the main difference between the diet of a Tudor nobleman and that of a peasant? What was it that changed Henry VIII from an active and pleasant young man into a vastly overweight tyrant? What did a gong farmer do? And what was the purpose of a whipping boy? 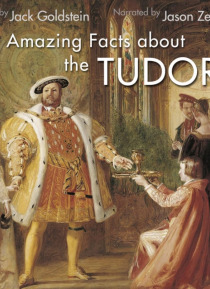 In this excellent audiobook, narrator Jason Zenobia answers all these questions and more as he talks us through… over one hundred amazing facts about the Tudors. If you're interested in one of the most fascinating periods in English history, this is perfect for you!